Recently Microsoft announced that they are going to end the support for Windows 7 in January 2020. After the 4 years of launch of Windows 10, still there are people who stuck to the older Windows 7 version. 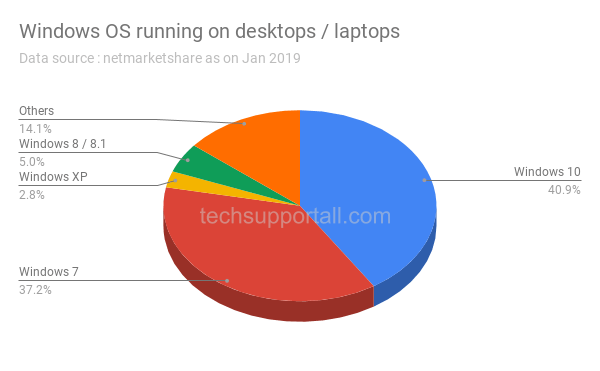 Approx 41% users are already using the Windows 10 operating system. But still 37% users are stuck to the Windows 7. Which is a huge number, when less then 1 year remains for the end of support. Even approx 2.8% users are using Windows XP whereas support of Windows XP was ended in 2014.
Business users still have the time up to 2023 under extended support. It is not easy for the business users to migrate their system / data to the newer operating system, So Microsoft give them more time with paid extended support. User interface wise Windows 10 is almost identical to Windows 7, so there should not be any issue in migrating to the Windows 10. Migrating data to Windows 10 is almost hassle free. All data and installed software will get migrated automatically during the upgrade process if they upgrade to the same system. What is End of support means? End of support means Microsoft will not release any security updated for the Windows 7 after the January 14, 2020. Along with Windows 7 support will also end for the Internet Explorer 10 and Windows server 2008. After that users may face many hardware / software compatibility issues. Windows 7 is a 9 years old operating system, So it is time to switch to the newer Windows 10 technology. It is not advisable to use Windows 7 after that as it will become vulnerable to cyber-attack. Refer this link to upgrade your existing installation or moving installation to a new device with upgraded Windows 10. If you require a new hardware then you can find your new windows 10 device from the Microsoft store. Q: Users whose hardware is older and is not supported by the Windows 10, What will they do? A: They either have to buy the new hardware or have to compromise with the security. Even business users can easily migrate with the help of Microsoft 365 Business. Q: Can I use the Windows 7 even after 14 January 2020? A: Yes you can use the Windows 7, even after the support end date, but you will not get any security update or support. Q: Will my Windows 7 or 8 key will work in Windows 10? Comment below if you are still using an older version of the Windows and tell us why you are afraid to upgrade?